Unlike most books about Korean shamanism in English langauge primarily focused on the lives of shamans (mudangs) and their ritual performances, God in Pictures in Korean Contexts: The Ownership and Meaning of Shaman Paintings by Laurel Kendall, Jongsung Yang and Yul Soon Yoon, discusses the creation and utility of the physical materiality of ritual artworks (taenghwa), and the rising number of institutions (a few museums and their curators and conservators) and individuals (dealers and collector of ethnographic materials) who have opened up the market for these objects. Koreans for the most part have yet to romanticize their past, given the century of cultural and political devastation during the majority of the 20th century. Kendall, an American anthropologist who has many books about Korean shamanic culture to her credit, is chair of the Division of Anthropology and curator in charge of Asian Ethnographic Collections at the American Museum of Natural History and president (2016-17) of the Association for Asian Studies. Yoon established the Gahoe Museum for his folk art collection in the Gahoe neighborhood north of Insadong in Seoul, and previously self-published the predominantly bilingual (Korean – English) Searching for Origin of Folk Religion – Painting of Shamanism , full of colored imagery of a multitude of spirits and brief explanations of their identities. The former curator of the National Folk Museum of Korea, Yang now operates a Museum of Shamanism, also in Seoul, as a place where shamanism may be observed in practice. The most frequent visitors to these establishments, Yang notes, are shamans themselves who express pride and wonder at what they see there. As we learn from these scholars’ thoughtful reflections, taenghwa, painted portraits of iconic images of the pantheon of spirits that populate the back walls of gutdang / shindang (ritual or spirit rooms), are not simply reflections of ubiquitous characters from cultural history (judges, saints, military and civil officials, venerable ancestors, spirits of the mountains and sea, etc. embellished with other auspicious symbols including the elixir of life, mushrooms, turtles, dragons, the seven-star constellation, pine trees, bamboo, a body of water in forest, tigers, etc. ), but are potent catalytic partners with the officiants in the ritual outcome. The authors postulate there is a “triangulation among shaman, god and painting.” These painted, seemingly folk art-like two-dimensional works on paper were created by artists (not usually the shamans themselves) for the express purpose of the shaman’s engagement with the painting’s “gaze,” thereby to enable the spirit to be present in the ritual space/time. In short, they reference taenghwa as “divine prosthesis”. Strung together from their tops into a multi-paneled montage behind an altar, often overlapping each other until only the faces are visible, in the ritual they form the wall behind the altar table festooned with offerings. The shamans’ costumes (changed often during the long rituals) and props are echoed in the uniforms and other paraphernalia used by officiants who seek communion and their mystical intercession in the course of multiscene productions. At the end of the ritual, unless affixed to the back wall, the taenghwa will be removed and stored until the next opportunity. While some taenghwa looked brand new (and may have been newly commissioned by the shaman through a patron’s generous donation for the ritual service) they can also be “antiques” weathered through use (unfolding, hanging, refolding for storage etc.). In some rare cases, I have seen full murals affixed to walls where various highly stylized portraits, including women in traditional “male” roles, share a common landscape in the background. Interestingly, I have seen several images created by Jean Michel Basquiat, an extraordinarily talented American artist who died young, that are remarkably similar in character to the taenghwa of the Hwanghae-do tradition! In 2000 I had the opportunity to be the guest of Kim Keumhwa, Korea’s naramansin, in her home and to travel with her group, Seohean Pungeoje, the Society for the Preservation of West Sea Rituals, from Hwanghae-do. Toward the end of the second of four weeks, Songsaengnim took me to Gangwha-do, the island near the DMZ off the West Sea where she now has a culture center. We stayed for two days at a small retreat center at the base of Manisan mountain that was operated by some kind of institute dedicated to Dangun, the mythical founder of Korea and a sanshin / mountain spirit of the highest order. 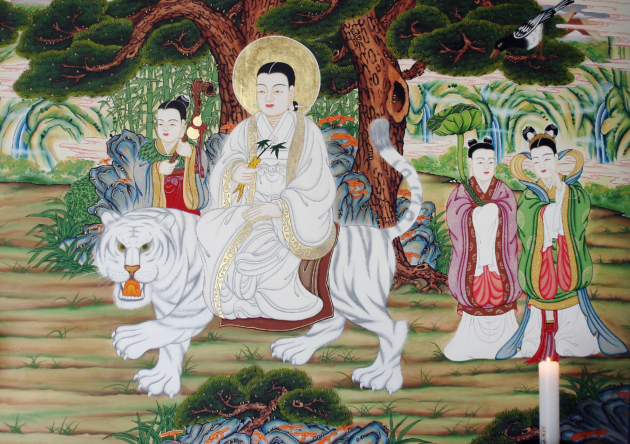 I was baffled by her effort to pay homage to a large, framed (glass, metal) painted image of the mountain spirit (a wizened old man with a tiger and young attendant) that was up a pathway on the north side of Manisan Mountain peak, when we could actually at minimum address the spirits of the peak in front of us. It was not an original painting, nor did it seem to be an old artifact, yet she carried offerings (fruit, candles, incense and water) and adorned the ledge in front of the image. She began to chant and invited me to share her homage through bowing and offering incense. Later we hiked up to where the Chamseongdan (altar) is sited, where Dangun is said to have offered sacrifices to the heavens. Shamans come by their taenghwa in several possible ways. Of course, Hwahghae-do shamans have to have been endowed through initiation, vision, dream, etc. to make the connection with particular spirits. Then it is the matter of securing the artwork. Since the earliest days (before printing presses!) paintings have been produced by dedicated artists (usually not the shamans themselves) from a shaman’s description of a vision. Unlike many painters who also may paint images for Buddhist temples, traditional Hwanghae taenghwa painters maintain a singular clientele among initiates of that charismatic lineage; they do not sign their work. I was very happy to learn more from the authors about the lineage of artist An Sung-sam, whose son An Chong-mo has carried on his father’s vocation and whose grandmother was a Hwanghaedo shaman, like the elder An’s colleague Kim Keumhwa. He was one of three (with Mansinnim and Choi Eum Jon, the late ritual jango drummer) deemed to be important intangible cultural assets of Korea. However, the authors state that, unlike venerable brush paintings and calligraphy of the Japanese Zen tradition, “No shaman painting has yet to be designated as a national treasure.” Facing the decline of the marketplace, the artists who are personally regarded and have the reputation of being endowed with a spiritual connection, may likely disappear. Judging from the styles of Songsaengnim’s taenghwa, several artists were responsible for creating them. The oldest ones seemed to be painted with tempera on cardboard or brown kraft paper (a material that was produced industrially in Korea after the war and was as much rendered into paper bags as it was as a surface for Tansaekhwa artists of the Minimalist movement); the ones permanently mounted on the walls in her shrine rooms in Seoul and Gangwha-do were more likely acrylic and enlivened with the addition of gold leaf in some areas. The now deceased elder An was also responsible for many of the hand-painted tissue paper elements that adorned Kim Keumhwa’s altars for rituals and in her permanent altars in her private shrines. Some seem quite old, but it is hard to know their age, etc. 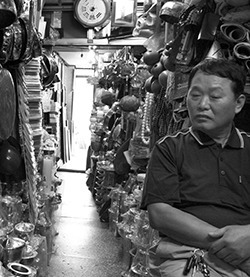 Other shamans, especially younger ones with less notoriety, may resort to patronizing shops specializing in ritual paraphernalia where they may acquire mass produced taenghwa with images “typical” of the geographically-specific ritual styles. I once visited such a shop in the neighborhood of Kim Keumhwa’s home. I was very careful not to be too interested in the goods in as much as my obvious presence in the otherwise no-tourist environs might be cause for embarrassing gossip that I might be shopping for shaman “power” tools; this would cast negatively on my host. The shaman is left with no other choice than to remove the taenghwa. Given their materiality, what is the appropriate way for a shaman to decommission / dispose of them. If the images have / are spirit, what becomes of it? “For most of the 20th Century, shamans generally followed the traditional practice of burning old and tattered paintings after ritually reanimating them,” the authors note. When the paintings of the first Korean shaman I met – Los Angeles 1990 about who I wrote an article for Kyoto Journal – had been destroyed in a flood (they were packed up, not used), the remnants were burned. The ashes were carried by us into the local mountains where we discarded them in a wooded auspicious spot, “Think of your mother,” she admonished me, with no explanation given. Unlike calligraphy scrolls used in Japanese tea ceremony which may be centuries old and are valued accordingly to their longevity, Korean shaman artworks are extremely fragile and were not meant to necessarily be employed forever, much less collected. Again, the authors recount fascinating stories about certain mischief (or worse) caused by improperly discarded or abandoned taenghwa. “The god operates miraculously or problematically, through a de-animated and hidden painting.” Do they have a “half-life” of empowerment? The authors address the more recent attempt to commodify taenghwa works and explain the complexities of another triangulation of dealers, collectors, shamans, less often the artists who created the works. There is well-considered discussion about the ways that a “collector’s lens” might distinguish what is desirable as an image, what Korean cultural qualities can be conveyed through this art form, etc. Of course, there is great interest on the part of scholars to study ethnography and to have material works with documented provenance can be of great value, as the authors’ own professional affiliations attest. One doesn’t see many shaman paintings displayed in Korean museums, and certainly not in the National Museum of Korea! Very few museums outside Korea collect or display works of “art” created for and used by shamans. In addition to AMNH, USC’s Pacific Asia museum is a notable exception as a result of the efforts of Yeonsoo Choi, assistant curator, and has welcomed Kim Keumhwa to demonstrate a sample of her rituals in conjunction with the donation of some objects to the museum’s permanent collection. No doubt the provenance of Kim Songsaengnim’s objects will vault them into a higher “value,” nonetheless, will they command the same level as Basquiat’s works? This brings us to the notion of the independent, private collector of material cultural artifacts who may have to resort to working with dealers with connections to shamans and never actually meeting the artist, who may be alive. The primary collectors of Korean shaman painting are themselves Korean with a “bent toward nostalgia for a not-to-distant rural past.” Much like the romancing of provenance that a collector of Japanese ceremony utensils might show in the course of the ritual or in a display case, the shaman paintings have an “object biography”. Yet again, the history of Korea would not be very kind to the paintings, much less the shamans themselves who were persecuted. Ritual spaces were usually erected in situ and quickly dismantled, with the various paraphernalia, including elaborate wall-sized arrangements of icons, packed up and sometimes even abandoned. Imagine my surprise a decade ago when I entered a Korean “antique” shop in Los Angeles’ Koreatown when I spotted a colorful tempera painting on cardboard of an old man with a tiger and young boy; it was hanging by fabric strings from the back of an abandoned dining room chair amidst other disparate furniture. “Buddha!” said the proprietor, an oldish man in a worn golf jacket and a baseball cap, noticing my interest and figuring that I was an uninformed Caucasian woman. “Ah, Buddha! Nice Buddha. Umm,” I replied, knowing full well, however, that it was not Buddha, but a taenghwa of Sanshin, a Korean mountain spirit, rendered for a shaman’s shrine. I retreated back into the shop as nonchalantly as I could, knowing that any interest that would inflate prices. I eventually found 10 other abandoned portraits of other traditional Korean shaman spirits rolled into a bundle with their strings hanging out jammed on a shelf next to empty picture frames. I made a mental commitment to this Sanshin that I would liberate him (and a trio of fortune-telling mudangs) from this soul-less place, if only to make it possible for their true identities to be reinstated. As noted above, in some cases the taenghwa are formally affixed to the walls. David Mason’s extensive research into the mountain spirit images enshrined in Korea’s temples, shrines, rock faces and even real and artificial caves and grottos is unsurpassed. Both his book Spirit of the Mountains: Korea’s SAN-SHIN and Traditions of Mountain-Worship (1999, Elizabeth New Jersey and Seoul Korea, Hollym. Editions in English and Korean languages) and ever-evolving website www.san-shin.org provide great insight into the artistic techniques and imagery as well as significance of this particular spirit’s presence throughout Korea. The artists, for the most part, remain anonymous, but the images are beloved by Buddhists, Taoists, NeoConfucianists and Shamanists alike. He notes, in addition to the mountain spirit, major Buddhist temples ’have a shrine building that often includes Samshin, a three spirit shrine, that includes images of Chilseong and Doksong, the Seven Stars / Big Dipper and Lonely Saint, respectively.’ His book explains the symbology and relationships within spiritual hierarchy. Yoon Yeosul’s book Searching for Origin of Folk Religion—Painting of Shamanism. [원형을 찾아서 토속신앙의 巫俗畵|, 2004, Seoul: ICOM] has excellent images and is mostly in Korean language. His Gahoe Museum is well worth a visit, as is Jong-sung Yang’s Museum of Shamanism which functions more as a living laboratory of Korean native spirituality. My article about the late Dr. Zo Zayong for Kyoto Journal #36, 1997, (reprinted http://www.san-shin.org/Zo-07.html) explores the work of this artist / collector / scholar / author and architect whose life was filled with the profound beauty of Korean spirit imagery. His Emile Museum in Seoul, later moved to become the basis of Samshin Hoegwan Songnisan near Po’un, was a huge collection of works on paper, in stone, wood and other materials. Most of the collection was sold to the Samsung Leeum, I’ve been told. Dr. Zo was also a patron of the local villages who still worshiped their resident spirits and often helped them create new iconic works to this end.